Haldex Concentric has won the contract to design and manufacture the water pump for the new 12 litre diesel engine of CNHTC (Chinese National Heavy Truck Group Company). After an accelerated development programme, Haldex Concentric's plant in Suzhou is already supplying quantity production to CNHTC in Jinan, Shandong province. Approximately 14,000 units will be supplied in 2010 rising to 30,000 by 2011. 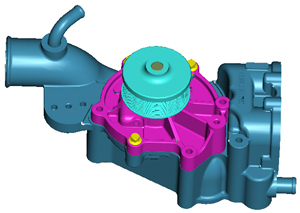 The water pump has been designed using the latest Computational Fluid Dynamic modelling to achieve a high level of efficiency but the innovative design also offers significant cost saving benefits. The design integrates a dual thermostat housing within the main pump housing significantly reducing the number of components required and eliminating their associated costs. Perhaps more importantly, all serviceable parts have been designed to be contained within a simple plug-in cartridge, so reducing total life costs for the engine. CNHTC's D12 engine was developed in conjunction with AVL and Denso to meet Euro III, IV and V emission standards. With rated speed levels down to 2000 rpm, the engine meets the highest international levels of economy, power, reliability and comfort. Design features include low noise and vibration and less gear shifting. Available in a range of options from 270 to 480 hp, the D12 series has been exhaustively tested both on the bench and on the road, where some 5 million kilometres have been covered in all the varied conditions of China's climate and terrain - desert, high plateau, heat and extreme cold. China National Heavy Duty Truck Group Company Limited, also known as the Sinotruk Group, is the third largest truck manufacturer in mainland China. Founded in 1935, the company started developing heavy-duty trucks in 1956 and became well known for the country's first vehicle in this category - the Huanghe model, which means Yellow River in Chinese. CNHTC was reformed and restructured in 2001, founding a subsidiary called Sinotruk (Hong Kong) which has been listed on the Hong Kong Stock Exchange since 2007. In October 2009, Sinotruk and MAN of Germany announced that they had signed a strategic partnership agreement covering licensed technology, share purchase and the implementation of a cooperation project. The agreement gives Sinotruk the exclusive right to use MAN's technology in mainland China and the two companies are to cooperate in the production and sale of a technologically advanced heavy-duty truck using MAN technology. They will also collaborate on the production and sale of technologically-upgraded trucks and engines that comply with Euro III, IV and V emission standards. Haldex Concentric's water pump for the new 12 litre diesel engine of CNHTC (Chinese National Heavy Truck Group Company) integrates a dual thermostat housing within the main pump housing, so reducing the number of required components significantly.